I've been going to a lot of professional development meetings this year about the power of an integrated curriculum and it seems there's a lot of teachers who are integrating arctic animals and winter sports into their classrooms. How fun is that! During our latest meeting we visited a classroom where the teacher presented a lesson in which she taught the students about how the characteristics of a penguin make them uniquely suited to their environments. To illustrate this she showed the students the following YouTube video to help them see how penguins toboggan in order to move quickly over the snow. She then compared the penguin tobogganing to Olympic skeleton racers, who also speed downhill at incredible speeds on their bellies. What a powerful lesson with so many jumping off points for curriculum instruction! I was immediately inspired to take this lesson one step further and add in an engineering challenge for my own students. I went directly to Amazon (you can find the products below with our affiliate link), and found some mini plastic penguins and fingerboards. When they arrived, I grabbed some cardboard tubes and prepared for some Penguin Races! Here are my son and I testing out the lesson. Who will win the Penguin Race? A penguin on his belly? The "skeleton racer" skateboard? Or, a penguin on a skeleton board? My son made some interesting observations while we were racing penguins. For example, he tried to reduce the incline of the ramp but immediately realized that the ramps became too weak at the midpoint and needed added support. We also tried adding tin foil to the ramps to make them look like snowy hills, but he quickly told me that we needed to take it off because "It's slowing the penguins down because it's too bumpy." I'm so excited to take this experiment into the classroom and see what my students come up with! Are you looking for more integrated curriculum ideas? 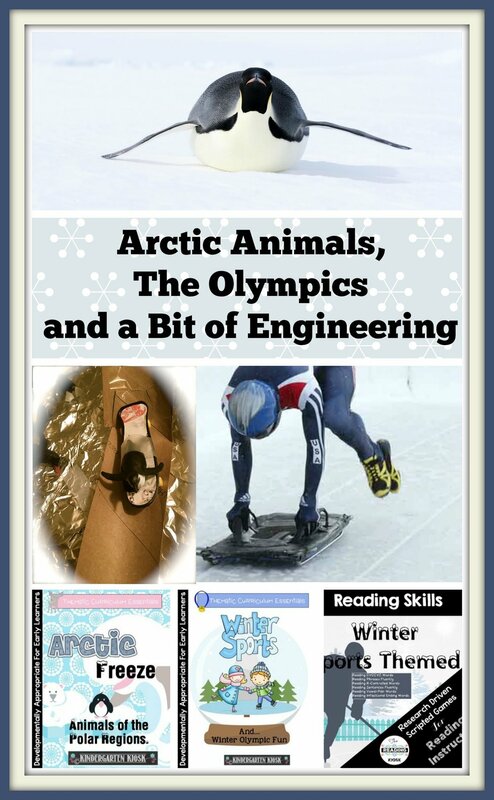 Theses Winter Olympics and Arctic Animal units are filled with ideas for curriculum integration! Are you looking for a higher level of interventions? These games are perfect for advanced Kindergartners on up. Currently I am using them for interventions with students grade 2-6. Needless to say, they are LOVING them.